Welcome to the Mary, Queen of Heaven School website! As the pastor, our school is an extremely important part of my ministry. Interacting with our students and teaching them about our beloved Catholic faith is one of the great joys of my priesthood! In addition to celebrating Mass with our students, I really enjoy eating lunch with them and attending their sporting events and field trips. You can often find me greeting the students at the end of the school day! At Mary, Queen of Heaven School we aim to provide a top quality education with an emphasis on our Catholic faith. From the moment our students enter the building they are surrounded by reminders of God’s love. 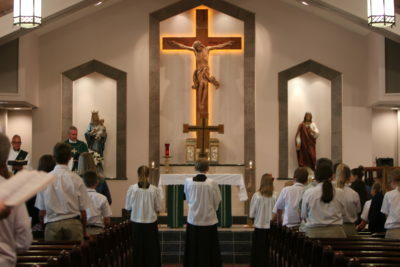 Crucifixes hang in every classroom and each day begins and ends with prayer. Our Catholic faith permeates every class and subject throughout the school day. We do all we can to impart, through words and actions, the values and beliefs of our faith. If you would like to talk to me personally about our school and parish, please give me a call at 859-525-6909, or just stop by the rectory anytime.